They are military inspired polarized sunglasses for men and women. 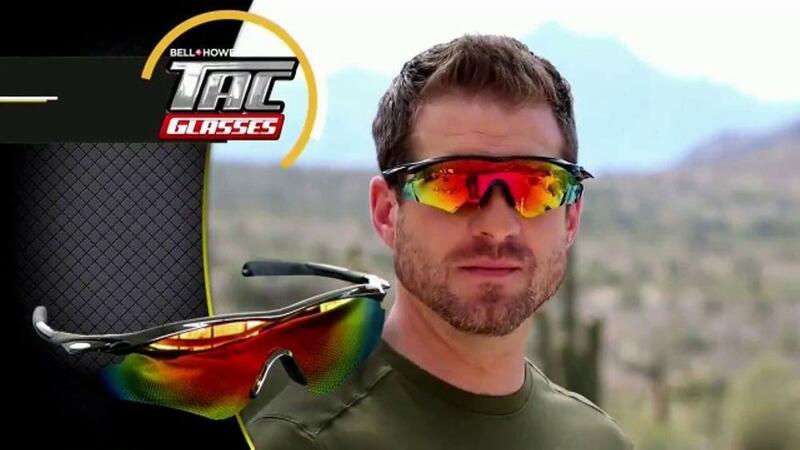 TAC Glasses are by Bell & Howell advertised on As Seen On Tv commercials. The name itself tells that these are sunglasses with enhanced vision and clarity. They are even capable of seeing surroundings even in the night. TAC Glasses – Extra-durable, black matte frame and rustproof screws; lenses are corrosion-proof against alkaline conditions such as exposure to oceanic sprays. HD Vision Special Ops – Optical quality lenses. TAC Glasses – Not Mentioned. HD Vision Special Ops – Euro style design. Battle Vision – Flexible Shape-memory polymer frames. Does it have UV Protection? HD Vision Special Ops – Yes. Can you use them in the night? 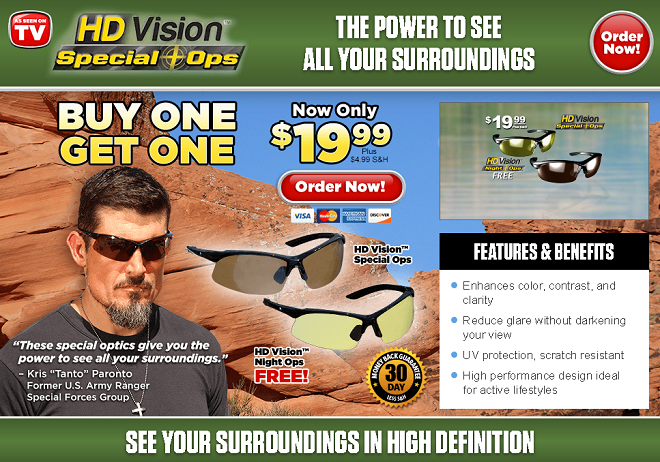 HD Vision Special Ops – $19.99 + $4.99 S&H. It is good for bright daylight driving and outdoor sun glare. The look of the frame is stylish. The sunglasses are extra-durable with black matte frame and rustproof screws. Lenses are corrosion-proof against alkaline conditions such as exposure to oceanic sprays. It has Light filtering technology. Does not much in eliminating the glare even though it is said to. Due to dark shade of the glasses, the view tends to be darker than expected. The sunglasses are cheaply made. They are quite uncomfortable to put on, the glasses comes off easily. HD Vision Special Ops provides great clarity and acuity. Look wise they are modern and cool. They are quiet comfortable and easy on the eyes. They really are anti-glare glasses. The lens tends to scratch easily. Made of cheap quality and flimsy plastic frames. Nothing HD about the vision through the glasses. Clarity of the sunglasses is really good. Exceptionally good coverage with the wrap around design. It is made cheaply, the lens scratches easily. The glasses made view darker than expected. Frame is too fragile and snaps easily. One thing majorly common between these sunglasses are that they all are military inspired sunglasses focusing on enhanced view and clear lenses. However, do these sunglasses really deliver the quality they promised? There is a sudden rage of As Seen on TV marketers jumping onto the tactical bandwagon. We have this TAC light, TAC lantern, TAC glasses, HD Vision Special ops all coming up under tactical bandwagon. Are these worth the buy and how are these different from the local ordinary sunglasses. TAC glasses lens are quite clear but not impressed with the design of the frame that goes up at the bottom. TAC glasses does help with the glare but the design might be uncomfortable for some as it may give in some light from the bottom. The frames are not highest quality plastic; they are like the one we get for $10 or $15 at the local Walmart. As far as the clarity and glares go, they do work in that part. Looks stylish, cool. Anti-glare polarization is good, can look towards the sun, and salt-pans. The opinion about HD vision special ops is somewhat the same as TAC glasses but look wise HD Vision Special Ops is much better. In addition, TAC glasses are more on the darker side of the shade whereas HD Vision special ops are on the lighter side of the shade giving pleasant and much better view. The night version of HD Vision optical ops seems to be much better than the TAC glasses, though it is not advisable to wear the glasses during night. As far as Battle Vision is considered, they too lie on the similar line of view as the above two. Having the flexible sunglasses is of no use if the material it is made up of is not durable and lens scratches easily thus giving a distort view. If we compare all these version of sunglasses vs the regular aviators, the aviators have metal frames much sturdier and gives similar kind of view. Over all TAC glasses, HD vision special ops, Battle vision seems as standard sunglasses and there is nothing extra-ordinary to them. Therefore, it is better to buy the regular sunglasses from the local Walmart with same price of $10 to $15. Also, check amazon.com or any other eCommerce site for more options in sunglasses and their reviews before buying any of this As Seen on TV sunglasses. Be the first to comment on "TAC Glasses vs HD Vision Special Ops vs Battle Vision"